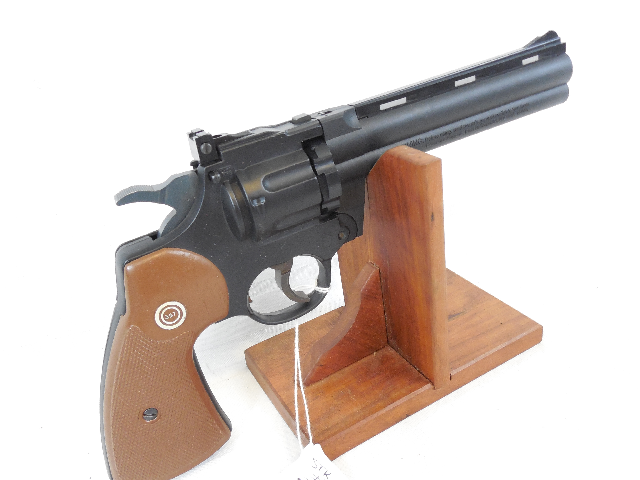 The Crosman Model 357 is a replica of the famous Colt Python revolver. It is very similar in weight and feel to the real thing. The Crosman 357 features, a rifled steel barrel, adjustable rear sights, and a 10 shot rotary clip. It uses one C02 Powerlet. This particular gun is in excellent condition. New were installed recently in our shop and the velosoity tested at 437 fps. It held air overnight. The appearance of this gun is near mint.